Chats Around the Copier with Paul Lees · ABS. A Better Way. 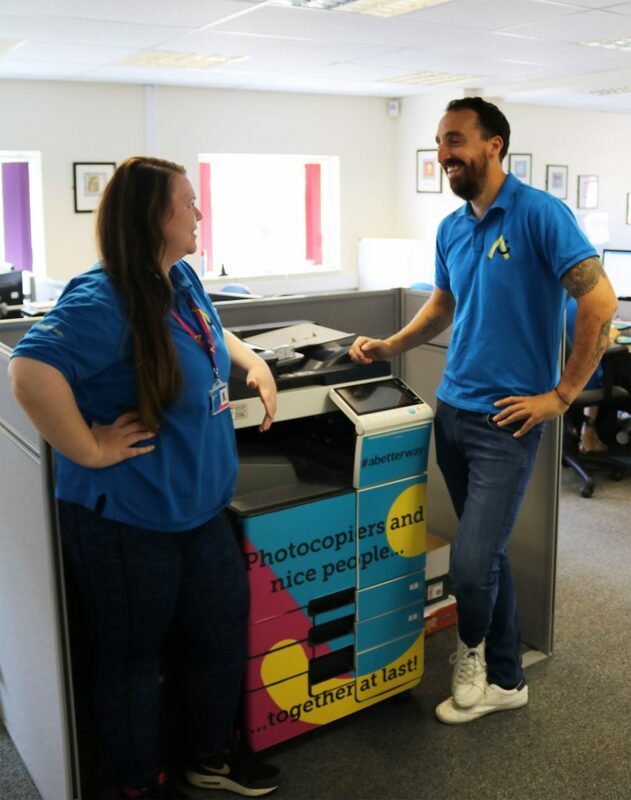 In this weeks ‘Chats around the copier’, Paul Lees, Operations Director here at ABS gives us insight into ABS’ future vision and how he feels he impacts positively in aiding further growth of an already successful family business. What key values do you hold in business? How do you gain useful business contacts? LinkedIn has been useful for attracting the best people and winning new business but the old tried and tested networking methods, primarily with our customers, and commercial partners such as Huddersfield Town Football Club and Connect Yorkshire still works best – I like to work with and through people who work with us first. How does your business differ from others in the copier industry? In one word ‘investment’. We invest heavily in people (very good people), technology and, through our corporate social responsibility (CSR) strategy, the wider community. These things breed “differentness” that customers and stakeholders recognise and then reward with their loyalty. What are two things you always carry with you? My phone and, when I don’t lose them, my car keys. Since the launch of the new, better ABS we have taken a more relaxed approach. Our colourful, branded polos and t-shirts really promotes our energetic and engaging personality. Who is your biggest inspiration in business and why? I would have to say Samuel Walton. This American entrepreneur took a small grocery and turned it into the giant Walmart supermarket chain, amassing a fortune of over $23 billion. He grew up during the Great Depression and worked hard to help make financial ends meet for his family, as was common at the time. His motto for success was ‘to learn all the rules, then break them all’. It was these risks that made him such a success and I feel you don’t get anywhere in business if you don’t take risks. What is your most substantial business accomplishment? Having been born into the end of the first real ‘IT generation’ I have sought to harness a raft of software and system solutions to make our customer’s experience of us a better one while letting great ABS people do the “richer” things. A growing customer base is testament to this investment. One example of this: five years ago every customer had to provide us with a meter reading from their printer or copier once per month and ABS staff spent four working days processing that information to generate hundreds of month-end device usage invoices. Today we have an automated service system in place which undertakes what would previously have been a lengthy process and produces a service update every two hours. This takes customer care to a whole new level and I’m very proud of both the facility and the team that made it work. It is still, without doubt, the people here. Irrespective of background our service, admin and sales teams give us their best day-in, day-out and our customers recognise that regularly. What goes hand in hand with good people however, is a determination to get it right when we fail and learn from the experience of failing. We have been venturing more into social media, the use of Twitter, LinkedIn and Facebook helps us reach more audiences than just the use of the website. In a B2B environment like ours we have secured a modest level of business through these platforms. While we’re purely on an organic basis at the moment, we will be focusing more on paid advertisements aiming to reach new target markets with our new exciting brand. Can you give us a successful business tip? Listen, listen, listen, and when you finally spot the real way forward, grasp it and make it work. When are you most creative or inspired? Normally its early in the morning, I’m at the gym by 6am and in work normally by 7:30 and I enjoy how quiet it is and how much I can get done. I always wanted children. I guess most dads with toddlers would say the same but when I’m doing all the things that dads do I forget about all the “work stuff” because children won’t let you see home life any other way. What do your breaks look like? I’m a bit of a fitness/health geek so I build my diet around my morning and afternoon breaks, which fall around 10.30 and 3.00. There’s no coffee though because I could never stand the stuff, I still can’t, so water and green tea are my main drink choices. Who would you most like meet? It would have to be Travis Kalanick, the CEO of Uber. He has been involved in so many projects, some of which have failed. This has only made him stronger and the growth of Uber is down to his perseverance to succeed. Just a few minutes to pick his brains would give me years of experience I’m sure. If you would like to find out more about ABS then please feel free to visit the rest of our website. You can find out about all our people by clicking here or please feel free to give us a call on 01422 880008 for a chat.